This column describes that in the twenties and thirties of the previous century the political party SDAP wants to realize the socialization. For this purpose she invents the intermediate phase of the public branch council (in short PBO). The ideas are presented in two reports, namely Bedrijfs-organisatie en medezeggenschap and Nieuwe organen1. The first building-blocks for this reform of the state are furnished by the then party leader P.J. Troelstra. The battle for the PBO is not a hallmark of the social-democracy, but a typically Dutch phenomenon. The public councils are actually publicly controlled cartels. Cartels are a natural part of economic life, and can result in efficiency and justice. The coalition prohibition of the nineteenth century, which originally targeted the Guilds, has been used mainly for banning the trade unions. The social-democracy wants to maintain the benefits of the cartel, and combat the disadvantages by means of public control. She disapproves of the anarchy of the private competition. The formation of the public councils remains interesting, certainly now that the extension of the European Union commands the establishment of new administrative organizations. The present bank union, the European System of Financial Supervision (in short ESFS), the European Systemic Risk Board (in short ESRB) etcetera are all bodies, that have a functional similarity with the then concept of the branch councils. Therefore the present column is relevant, although it required seventy preceding columns for its realization. Many more will follow, certainly also concerning this theme. It is surprising that the public branch council (PBO) is not a find of the social-democracy. The marxist mainstream of the social-democracy follows the revolutionary tradition of 1848. Just like at the time the bourgeoisie subjected the nobility and the absolutist king, the social-democracy expects a coup d'état by the proletariat. The bourgeoisie has no place in the future rule, because the working class best understands the reality. Councils, consisting of various classes, do not fit in that view, and even the state itself is an alienating element. For, Marx merely experiences the police state of the nineteenth century, and rejects it2. However, the introduction of the universal suffrage ends all revolutionary illusions, because the social-democracy does not gain the democratic majority. Compelled by necessity the Sociaal-Democratische Arbeiders Partij (in short SDAP) tries to find other ways to increase her power. The socialization, the core of the social-democratic policy, must be realized in a democratic manner. The paradigm of the revolution is replaced by a policy of gradual reform towards socialism. It has already been remarked in the column about the Socialization-report, that the new orientation is a painful mental process. The Leninists, who were once congenial to the social-democracy, get lost in the chimera, that apparently the proletariat must be educated in and by the dictature. First, some social-democratic ideologists advocate a reform of the parliamentary system, so that besides the existing States General an economic parliament is established. This proposal of a Third Chamber originates from the English couple Beatrice and Sidney Webb. In the Netherlands that idea is embraced by the SDAP-leader P.J. Troelstra. Thus the territoral organization of the state hierarchy (provinces, municipalities) is supplemented by the functional organization of the hierarchy (professions and products). The proposal is a weak echo of the conviction, that the working class must be in control. Troelstra refuses to give up the central idea of the social-democracy, namely the class struggle. Now that the universal suffrage does not lead to a break-through, he questions the parliamentary system3. The state theory of Troelstra has gained some fame. But a later study has show, that the model is rather vague4. First, Troelstra complains about the functioning of the States General, even after the introduction of the universal suffrage in 1919. 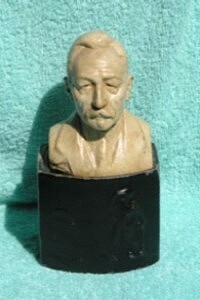 Already in 1907 he believes that the parliament suffers from a lack of vision and expertise. Therefore the bearing of the democracy must be increased. Incidentally, Troelstra is certainly not an extremist; when in 1913 joining in the government becomes possible, Troelstra is one of the advocates. In 1920 he again addresses the constitutional theme, hoping to take advantage of the social unrest. After 1923 the revolutionary spirit of the time fades, and Troelstra retires, physically exhausted. Troelstra tries to find ways to win over the confessional workers to the socialization. He states, that this can not be done by means of parliamentary actions. The state opposes the efforts for socialization, because he is not politically neutral. The political debate is dominated by religious controversies among the secular, catholic and protestant groups, so that the economic debate is stifled. At the same time, the proletariat and its congenial groups dispose of the majority, as a class. Therefore a supplemental state-construction must be established, which can lead the ideology in the desired direction. She must rule besides the political parliament, and not under it5. Troelstra wants to realize a functional suffrage, so that the actual operation of the economy is transferred to the workers. In fact that process already unfolds, since ever more industry managers earn wages. The new economic parliament must administer the economic activities. In the system of Troelstra the members of the economic parliament are not elected by the population, but appointed by a variety of economic organizations. Notably the trade unions can play a role in the democracy, by means of the economic parliament. That development could push back the coercion on politics by the factor capital. Moreover, in this manner the executive power of the government is constrained within limits. The branch councils, that each administer their own sector or department, are at the basis of the economic parliament. According to Troelstra the branch councils are the domain of the workers, and a separate representation of the general interest or of the consumers is unnecessary. He believes that the workers themselves will guard these interests6. The composition of the economic parliament, and the functional organization beneath it, create favourable conditions for a minimum of bureaucracy. Nevertheless, within the SDAP Troelstra has hardly any supporters for his state model, nor within the foreign sister-parties. Your columnist does not see the need either. The majority does want new bodies, but they must be subordinated to the States General. Thus the SDAP is more moderate than her leader. However, in the Socialist International (in short SI) she does represent an avant-garde. In continental Europe the SI is not very interested in the economic order. She mainly demands workers' co-management, among others by means of works councils (in short WC), and the socialization of the commerce and industry. Merely in England the social-democracy is engaged in ordering. Especially the famous Fabian society, which includes the Webb couple, is here the driving force. Indeed during the First Worldwar England already creates economic councils, called Whitley councils, although these are merely established on a voluntary basis7. Thus the struggle for the establishment of the PBO is not really a hallmark of the social-democracy, but a typically Dutch phenomenon. This can probably be explained from several factors. The state model of Troelstra will have left some impression. And a number of prominent Dutch social-democrats (P.L. Tak, F.M. Wibaut) sympathize with the ideas of the Fabian Society. It is conceivable that also the typically Dutch system of pillars, with fairly good relations between the leaders at the top, favours the PBO concept. And the Dutch trade unions (with the exception of the small NAS) are less radical than elsewhere in Europe. Meanwhile, the bourgeois groups are not blind to the socialist ambitions. The Roman-catholics have made proposals for branch associations in the Papal encyclical letters Rerum novarum (1891) and Quadragesimo anno (1931), as a platform for discussions between the classes. The liberals have established various state councils, which give expert advice to the government. The social-democracry is forced to adapt to the new developments. She advocates the PBO, because she believes that it gives a voice to the society (the people). The table 1 gives a summary of the entities, which according to the various ideologies are the driving force in the society. Thus a broad social coalition supports the branch councils8. There is a unanimous agreement with regard to its structure: each branch establishes its own branch association, with at the top a branch council. All branch councils together are united in the national Central Economic Council. However, each ideology has its own elaboration. The liberals state that the bodies are expertise centres, and the social-democrats also value the presence of expertise. In some branches the entrepreneurs interpret the branch council as an easy way to form a cartel9. The Roman-catholics prefer paternalistic associations, where the entrepreneurs can show their social leadership. The protestants prefer the sovereignty in the circles, and want to restrict the branch councils. The view on the state of the social-democracy adapts, according as the revolutionary generation of politicians from before the First Worldwar retires (Troelstra, Bebel, Webb, Vandervelde etcetera). The state must not disappear, on the contrary, he is indispensable as the defender of the legal system. The separate interest groups miss this capability. Consider for instance the promotion of the interests of future generations10. But the state must legitimize itself with respect to its civilians. Here loyal readers recognize the argument of the German sociologist H. Ganßmann, that the state can be the instrument of the society for therealization of reciprocity, for instance by means of the redistribution of incomes. Yet the social-democrats are aware of the importance of public bodies, besides the existing territorial democracy. The SDAP publishes her views in two leading reports, namely Bedrijfs-organisatie en medezeggenschap and Nieuwe organen11. 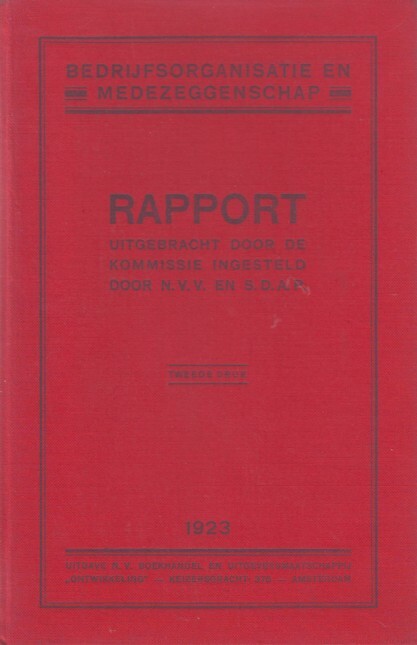 The report Bedrijfsorganen en medezeggenschap (1923) is the immediate successor of the Socialization-report. The social-democrats view the PBO system mainly as an opportunist instrument. They want to integrate socialism in the society, and hope that the PBO can further their goal. The PBO can be the battle field for the trade unions and for the political party. Notably the trade unions appreciate the PBO as a recognition of themselves as an institute, at least in the Netherlands12. Foreign trade unions tend to fear, that the workers will be pacified by the PBO. Nevertheless, in the PBO the conflicts between the workers and the entrepreneurs can be mitigated, as long as the balance of power is fair. That is a first step towards the classless society. In the background the success of the Russian Soviets, the workers councils during the failed Russian revolution of 1905, has some effect. At the time the Soviets were formed in a spontaneous manner, as a natural institute of workers self-management13. However, by far the most important social-democratic argument in favour of the PBO is, that it can lead to a socialization of the power to manage (say, having the disposal of) the property. The socialization can occur without the necessity to buy the means of production from the private owners. For this it is of course essential to provide the PBO with extensive powers to (legally) ordain. It must become a truly powerful public body. In a certain sense the structure of the PBO in the social-democratic form is ambiguous. Traditionally there is the class conflict between labour and capital. The PBO encompasses, besides the representation of the entrepreneurs, also a representation of the workers, so that the factor labour finally has its own say. However, it is realized, that there is also a conflict between the producers and the consumers. Therefore the PBO must also include representatives of the consumers. Since many of the consumers are not organized, and incidentally the general interest must also be defended, this third group in the PBO (besides labour and capital) is composed in a pluriform way. The three groups are represented on an equal footing. Since the PBO is meant to be self-management, it chooses its own field of competence. However, the reports make many suggestions, both of an economic and social nature. It is intriguing that the SDAP reports want to delegate the price formation within each Branch association (sector) to the corresponding Branch council. A central coordination of the price system is absent, that is to say, there is no economic plan. In this respect the SDAP view differs from the Leninist system, which does charge the central planning agency with the price formation. Considering the economic theory, it is doubtful, that this system of public branch associations leads to an optimal price formation. The situation is complicated further by the suggestion in the SDAP reports, that the wage level must be determined in the collective agreement (in short CAO) between the organisations of the entrepreneurs and the trade unions. The public branch associations are not included in these negotiations. For instance the sociologist Ed. van Cleeff, an adherent of the aristo-democracy, has criticized this construction, which lacks a total plan14. In the SDAP system there is a real risk, that each Branch council will try to raise the product prices of its own branch. The SDAP reports acknowledge this problem, and therefore have added the third group to the PBO, which must defend the general interest and the consumer interests15. The third group even has the right to veto any decision of the Branch council. Nevertheless, it may be assumed, that this third group is no match for the two groups of producers, and their expertise. The SDAP system evidently introduces a moral hazard in the price formation, although it is hoped that it is curbed by the true social ("socialist") mentality. Striking is also the plea for the policy of establishment. The PBO is a cartel, that can supply concessions and permits for entering the branch. This prevents a vicious competition between the enterprises. Enterprises must prosper sufficiently for paying decent wages and developing new products. The downside is evidently, that outside entrepreneurs are excluded. Note, that cartels are active even in the present economy, for instance in professional associations of the well-educated. The report Bedrijfs-organisatie en medezeggenschap pleads in favour of a law concerning the Works councils (ondernemings-raad, in short OR). The report even contains a concept law as annex III. At the time the OR is already legally realized in Central Europe, whereas on the other hand in England the voluntary works-committees have a withering existence. Therefore the authors of the report prefer a legal framework. They expect, that the establishment of the OR will increase the satisfaction of the workers. Often the OR allows the workers to better understand the actions of the entrepreneurs. Therefore the report hopes that the productivity of labour will rise. The most important tasks of the OR are controlling the CAO and safety regulations and the like. 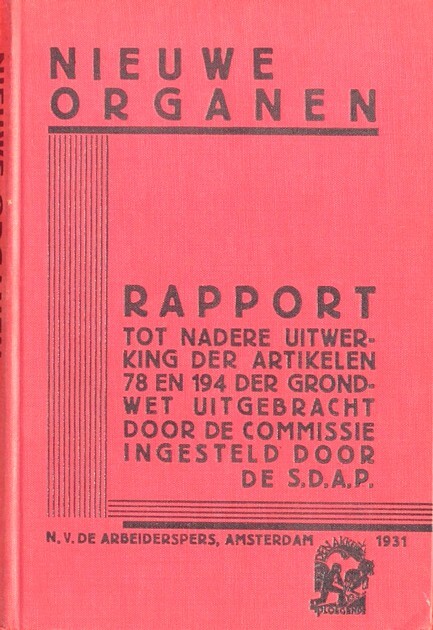 The committee for the report Nieuwe organen starts her work already in 1926. The committee is disappointed, that the new public associations are still not established, although the Constitution allows them since 1922. Perhaps in order to promote the PBO with the political opponents, the report stresses, that the PBO is in fact an outsourcing of certain state activities. The foundation of the state is widened, when the commerce and industry engage in self-regulation. In Nieuwe organen the system is described with more detail and clarity than in Bedrijfs-organisatie en medezeggenschap, but in fact the report does not add anything new to her predecessor. Since the publication of the two reports the works council (OR) has amply proven its worth16. This does not hold for the PBO. In principle the socialization of the power to manage the property is an interesting core argument for the social-democratic line of action, an ideological anchor, and applicable on all administrative levels, up to an including the European Union. Yet De Liagre Böhl is right with his statement, that it is difficult to make propaganda for socialization, because the whole idea is vague and abstract17. The first step is the establishment of a Central Economic Council, because this provokes little resistance. On the other hand the formation of the Branch councils conflicts with so many established interests, that she is socially very radical and destabilizing. Then convincing arguments are needed to continue the process. The standard argument is, that the anarchy and lack of order must be ended, with as a positive consequence the rise of the efficiency. However, in the column about socialization this argument has been questioned. Much of the anarchy can be repared with ad hoc measures, without a general system reform. The PBO has been defended as a manner to avoid bureaucracy. On reflection, the network of councils is a possible breeding-ground of bureaucracy and indecision. The PBO is a cartel, and that has benefits and disadvantages. The present column has mentioned a number of problems. For instance, it is difficult to guarantee a coherent price policy. And the issuing of permits to enterprises must not result in a lax industrial culture. The PBO system invites to make a comparison with the Leninist planned economy. She also groups the production into branch associations. The task of the Branch councils is delegated to the so-called product ministries, which are indeed bureaucratic fortresses. More than in the PBO system the activities are centrally coordinated. Although this causes rigidity, it does guarantee the stability of prices. And the state can simply coerce the branch associations into obedience. After all, the choice between the PBO system and the central planning appears to be mainly a matter of national tradition and habits. There is so much political controversy about the branch associations, that the social consensus can easily wither. In the Netherlands such bodies indeed had an important side effect, namely the furthering of the contacts between the ideological pillars. The development of the PBO is a search process and an evolution. 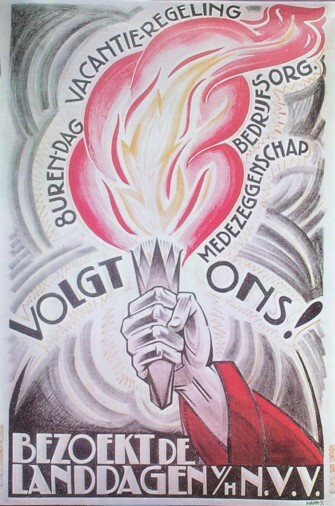 The Dutch situation was still favourable for the PBO, because immediately after the Second Worldwar the social-democrats and the Roman-catholics can form a governing coalition with a firm democratic majority. Precisely these two pillars have at least for the near future similar ideas about the elaboration of the PBO.